Fasting is done for all kinds of reasons, even in 21st Century America. I think that the reasons we fast expose what we cherish more than anything. Wrestlers, boxers MMA fighters fast to make the weigh-in for the big championship. Models fast to keep their high-dollar contracts, and to get the ooos and aaahs and breathless gasps of their eye-boggled audiences. Patients fast to get a report of good health from their doctors. The oddity is a religious fast. For example, when Muslims fast during Ramadan, Americans call them fanatics and radicals. Its oddness is so far spread that likely most American churches have given it up altogether. So I will need to start at square one: What is the fast the LORD delights in? The LORD’s Decree (v.1). 1b defines v.2-3a. The LORD’s Diagnosis (v.3b-5) – all show (1.10-20). “Isaiah says, If your fasting leaves you self-indulgent in other areas, harsh toward your employees, irritable and contentious, then your fasting is not acceptable to God. So God is mercifully warning us against the danger of substituting religious disciplines for righteous living” (John Piper, “A Hunger for God,” 134-5). God’s Pleasure 6-7, 9b-10a (Maybe give the food or funds to the Deacons Fund, Project 66, etc). 1st Principle: This is not either/or, but both/and. You see this in 1.16-20. 2nd Principle: Throw your body into your begging, your posture into your praying. “…we are created as a body-soul unity, and bodily postures and disciplines can indeed enhance reverence and humility of mind and heart” (Alec Motyer, “The Prophecy of Isaiah,” 481); “… communicating with God entails much more than putting words together. 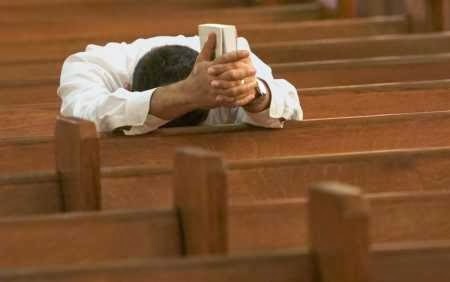 Christians often think that prayer is simply a matter of using proper terminology and putting standard ideas in an acceptable verbal format. But communication in prayer entails much more. God pays attention to the inflection of our voices, our expressions, our posture, and other forms of body language” (Richard Pratt Jr., “Pray with Your Eyes Open,” 163). 3rd Principle: Fasting is chiefly about wanting God himself. “…fasting is mainly an expression of the soul’s hunger for God. …fasting rises up as a way of saying earnestly with our whole body what our heart feels: I hunger for you, O God. Fasting expresses, rather than creates, hunger for God (Piper, ibid., 89-90). I invite you to join with us in prayer and fasting over the next 6 Wednesdays. As you fast in some way through the day, spend more concentrated times praying. And then come and conclude the time by gathering in prayer with us – if you can (In the New Fellowship Hall). If you can’t, then unite with us to pray wherever you are. Finally, as you fast, remember our Lord’s 40-day fast (part of his active obedience on your behalf) and his fasting through the trial, scourging and crucifixion for us and for our salvation. Ironic - I fasted a Sunday - because I need to feel closer to God and my brother in-law and family are fasting for Ramadan. However, they make up for it when the sun goes down! I need to hear your sermon.